Anacamptis sancta is extremely rare and localised within its range. The Holy orchid flowers are reminiscent of those of the Bug Orchid Anacamptis coriophora, but they are much larger and more variable in colour. The lip of the flower is unspotted, and by the time the flowers open the basal leaves of the plant have died back almost completely. The colour of the flowers of Anacamptis sancta varies from pink to red. 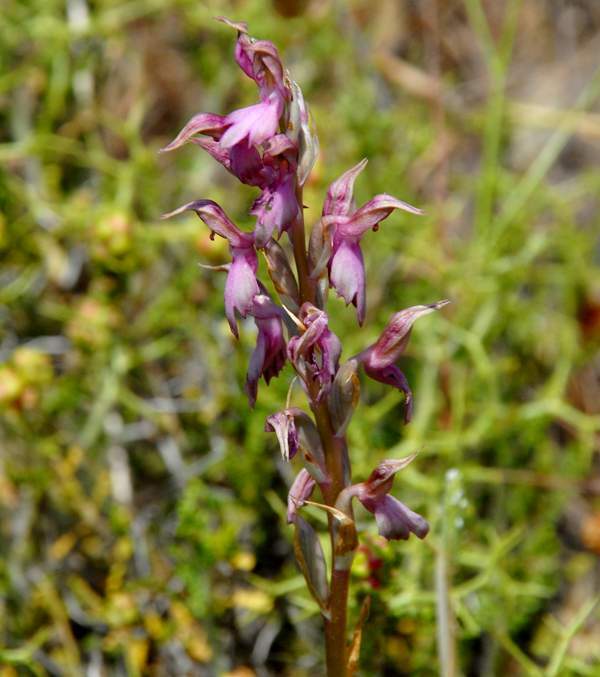 This rare orchid is an eastern Mediterranean species and is found in the Aegean Islands, Turkey and Cyprus. The Holy Orchid favours dry and stony ground. This orchid flowers in April and May. Although inclined to grow in isolation this species sometimes hybridises with Anacamptis coriophora resulting in large hybrid swarms. The photograph shown on this page was taken in Lesvos. This page includes a picture kindly contributed by Ray Tipper.